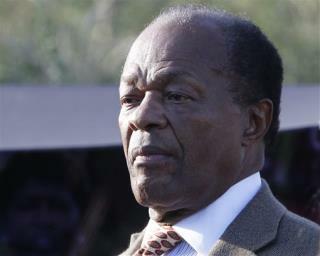 (Newser) – Divisive and flamboyant, maddening and beloved, Marion Barry outshone every politician in the 40-year history of District of Columbia self-rule. But for many, his legacy was not defined by the accomplishments and failures of his four terms as mayor and long service on the DC Council. Instead, Barry will be remembered for a single night in a downtown Washington hotel room and the grainy video that showed him lighting a crack pipe in the company of a much-younger woman. When FBI agents burst in, he referred to her with an expletive. She "set me up," Barry said. Barry died today at 78. His family said in statement that Barry died shortly after midnight at the United Medical Center, after having been released from Howard University Hospital yesterday. No cause of death was given, but a spokeswoman said he collapsed outside his home. No man helped demonstrate the stupidity of D.C. voters more than he. R.I.P. As a former Washingtonian, I can attest that he was always fodder for good joke.